Sudan's military says it has seized control of a key rebel stronghold in the western region of Darfur. An army spokesman, Al-Sawarmi Khaled, said more than 100 rebels from the Justice and Equality Movement (Jem) had been killed in the Jebel Moon area. The rebels say they left the area last month to avoid civilian casualties. The insurgents signed a preliminary peace deal and ceasefire with Khartoum in February, but then pulled out after accusing the government of acts of war. The BBC's James Copnall, in Sudan's capital Khartoum, says the Darfur conflict has flared up in the last few weeks after calming down in recent years. There has been a huge change in the situation in Darfur as the rebels now appear to be dispersed in small groups throughout the area, including the neighbouring region of Kordofan, our correspondent says. 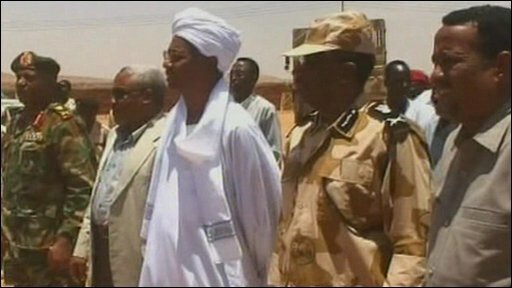 Sudanese television broadcast footage on Saturday of senior military officials visiting the former rebel stronghold. The military is claiming it scored a major victory over one of the two most significant rebel groups a day earlier. "We have liberated Jebel Moon from the Justice and Equality Movement and killed 108 members," army spokesman Mr Khaled told reporters in Khartoum. "We have detained 61 rebels and confiscated 16 cars and three large trucks." But a senior Jem official told the BBC his men had voluntarily withdrawn from the area three weeks ago, to redeploy as mobile units. He said there had been no combat in the last few days in Jebel Moon as his fighters had already left. However, both sides agreed there had been clashes farther south on the Nyala to Ed Daein road in South Darfur on Thursday. Our correspondent says again there is disagreement about how many people were killed and it is difficult to verify what happened. Some 300,000 people have been killed in Darfur, according to the UN, and more than 2.6 million displaced since ethnic rebels took up arms in 2003.